Although you are not required to take BA371 (Business Data Management) before you take this course, we do recommend that you do so. We will learn about IS system design and development processes and methodologies. HTTP: how to have and maintain state in a stateless world. ASP.NET and LAMP web programming stacks. Basic user interface design principles. Compilation, interpretation and byte-compilation: toward 'fluid' infrastructures. Accomplishing system-level tasks and simple meshups using some shell scripting. Agile development approaches and techniques. 'Tarchitecture' vs. 'Marketecture:' the technical vs. the business side of system architecture. Systems development life cycle (SDLC) in practice; the case of OSU's Center for Applied Systems and Software. Presentation of designs and prototypes. Specify and evaluate conceptual architectures for business information systems solutions. Research design solutions for IS architectural problems. Design basic IS architectures and propose components and relationships for those architectures. Communicate and explain design proposals and decisions within and across teams of designers or a sponsoring agency. Architect and prototype part of a real-world system in an architecture of your choice. Work in and contribute to a system design and development team. Understand, explain and apply the concepts and practices of agile development. Communicate about and feel somewhat comfortable with Linux (read: Unix-like) machines. Develop simple Linux shell scripts. Conceptually switch between the LAMP and ASP.NET worlds. Understand how to live with and overcome the statelessness of HTTP. Lectures, labs and project sessions. Two (2) coding assignments (homework). For assignments and deadlines, see the schedule below. Since code reviews are a normal part of software development, you are each asked to review and grade the coding assignments of two of your colleagues. Team design and prototype project: teams of five (5) people will each design and document an externally-sponsored IS application. Exams and quizzes: two (2) quizzes and a midterm exam. Presentation: each class project team presents its work by the end of the term. Thu. June 6 (last day of class) (10:00 AM - 12:00 PM): project presentations with sponsor. Attend BIS@OSU day (Apr. 26) panels. Ford, P. (2015) The Code Issue. 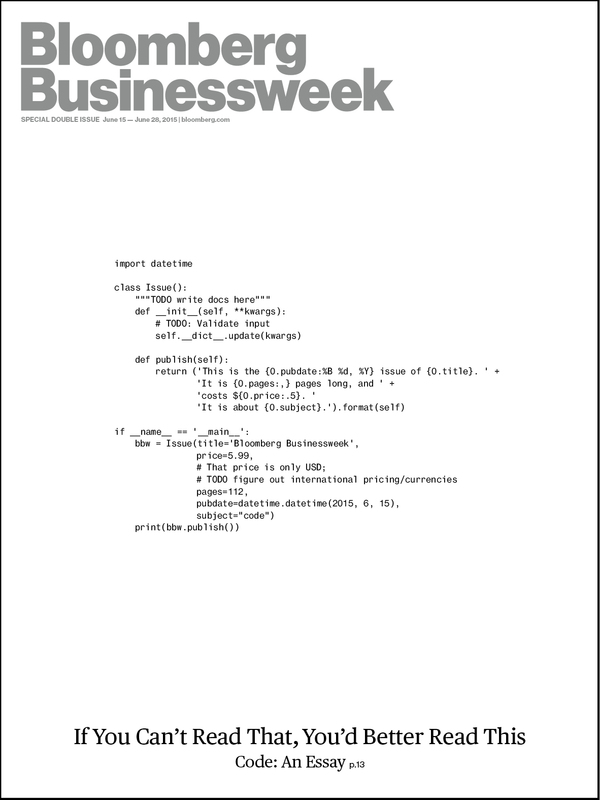 Bloomberg Business Week Magazine (also freely available on-line through OSU-library —> Select database —> Business Premier Source). Kock, N. (2007) Systems Analysis & Design Fundamentals. A Business Process Redesign Approach. Sage Publications. (Available free on-line through OSU library/ONID). Hohmann, L. (2005) Beyond Software Architecture (selected chapters). How Do You Type an A? Class project Berners-Lee, T. (2019) 30 years on, what's next #ForTheWeb? HTTP How Does Code Become Software? Apr. 16 IS impact assessment Why Are Programmers So Intense About Languages? What Do Different Languages Do? ASP.NET Class project: design an impact assessment plan. Class project: model an improved version of the process. Aug. 25th, 2016: Linux is 25 years old. 25 reasons people love Linux. What Is the Relationship Between Code and Data? Baldwin, H. (2013) Rise of the UX Expert. Computerworld, Mar. 11. Pogue, D. (2018) Automobile Dashboard Technology Is Simply Awful. Scientific American, 318. 4. May 16 How does Testing Work? How Do You Pick a Programming Language? * 'Team grade' means that all members of the team receive the same grade. However, as an individual, you will only receive that team grade if you have appropriately and sufficiently contributed to the team's accomplishments. Simply put: if you do not contribute, you will not receive team credit. !! !Deadlines, exam dates, submission dates and presentation dates stated in this syllabus are firm and will not be altered to accommodate the schedules of individual students !!! Integrity: The quality of being honest and having strong moral principles, integrity stands as the backbone of character and is essential for success. Respect: Respect for others and yourself is a commitment to the fair treatment of and the fair competition with others. Through respect we embolden the character of others and ourselves. Responsibility: We are held accountable for our words and actions as professionals to embed a steadfast commitment to honor in our decisions. According to OSU student conduct regulations, academic misconduct is defined as an intentional act of deception in which a student seeks to claim credit for the work or effort of another person or uses unauthorized materials or fabricated information in any academic work, either through the student's own efforts or the efforts of another. Refer to the OSU Code of Student Conduct and http://studentlife.oregonstate.edu/studentconduct/offenses-0 for a comprehensive definition of academic misconduct. All cases of suspect academic misconduct will be handled in strict accordance with OSU policy and College of Business policy.